Mouth guards are a valuable tool in protecting teeth and overall oral health. It’s important to care for it properly so that it can continue protecting you for as long as possible. If your child has a mouth guard, his or her daily oral hygiene routine should include mouth guard care and cleaning. Follow the steps below to keep the mouth guard healthy and clean. Rinse your mouth guard immediately after wear. You should rinse your mouth guard with warm (but not hot) water as soon as you take it out of your mouth. This will remove debris and prevent dental plaque from building up on it. Using a designated toothbrush and some mild, antibacterial soap, lightly brush your mouth guard after you wear it. Don’t use toothpaste for this, as it is abrasive and could damage the mouthguard. 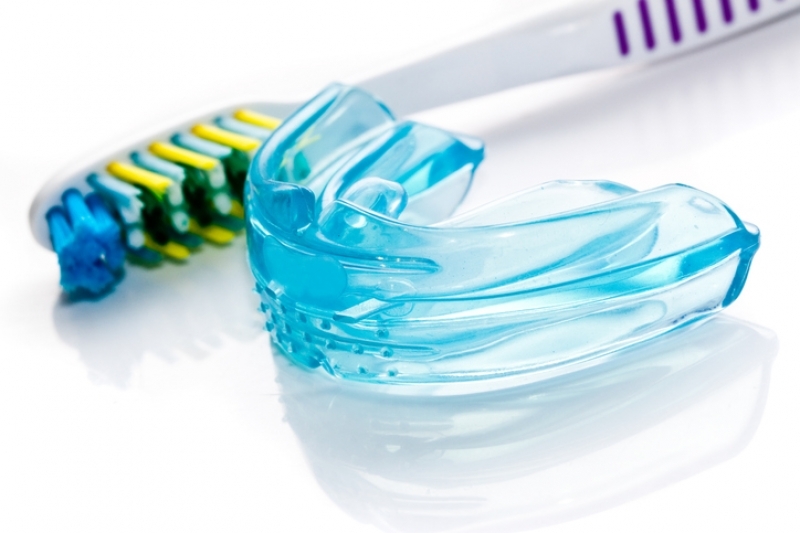 Make it a habit to clean your mouth guard weekly. To do this, you have a few options. You can use an over the counter denture cleaner, and soak your mouth guard in it with some water. Wait until the cleaner has completely dissolved in the water. You can also do the same thing with a mixture of vinegar and hydrogen peroxide. Soak the mouth guard in distilled vinegar for 30 minutes, rinse, and the soak it in the hydrogen peroxide for another 30 minutes, and then rinse it again thoroughly. Finally, you can use a combination of mouthwash and water. Use a capful of mouthwash and dilute it with water until the mouth guard is fully submerged. Let it soak for 30 minutes. Before storing your night guard in its case after cleaning, let it dry out completely. This will prevent bacteria from growing. Your mouth guard will be dry within 15-20 minutes. You’re less likely to lose or damage your mouth guard if you always keep it stored safely in its case. There’s no point in carefully cleaning your mouth guard if you don’t also clean the storage case. You can keep it clean by washing it every few days with regular dishwashing detergent. Don’t actually put it in the dishwasher though, as the high temperatures could warp the plastic. Allow the case to dry completely after washing to prevent bacteria growth, and replace your case every 6 months to a year. If you need additional advice on keeping your mouth guard clean, contact our North Delta children’s dentists.